A major estate agency partner has pulled out of Tesco’s newly launched property website, concerned that Tesco’s practice of listing private seller’s homes for £199 conflicts with its own business. The Times is reporting that fish4homes has pulled out of its contract with tescopropertymarket.com. The move will initially damage Tesco’s plans, as it would have expected to see many thousands of referrals from the fish4homes portal. Other online property portals have already refused to co-operate with Tesco, as they mainly rely on estate agents for their business, and Tesco’s DIY model excludes them altogether. 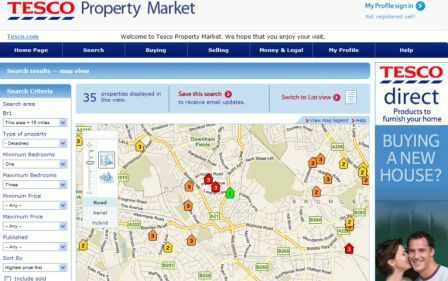 All of the properties listed on Tesco’s property site at the moment are supplied by fish4homes, so the withdrawal of the listings may have quite an impact to begin with. However, in the longer term, who would bet against Tesco? Has fish4homes done the right thing by drawing a line and marking out Tesco as a competitor? Or, is this a dangerous / righteous ploy that may see Tesco redoubling its efforts to establish a real foothold in this nascent marketspace? Brands are still an important influence on online consumers, according to a new study by AOL and the Henley Centre. However, the research also asserts that customers are becoming less loyal to brands as a result of their online experience. People who research their electronics purchases on the internet spend 10% more in store than those who don’t research online, according to a study by Yahoo and ChannelForce. Yahoo and ChannelForce surveyed 1,100 US adults in electrical stores, and found that the majority of electronics buyers researched their purchases online before visting the store. Problems with the checkout process constitute the single biggest loss of revenue for many e-commerce sites, with almost half of online retail transactions abandoned at this stage. According to figures from Marketing Sherpa, the average abandonment rate for shopping carts is 60%, of which 12% give up before hitting the checkout. This means 48% of potential customers bail out at the checkout stage.